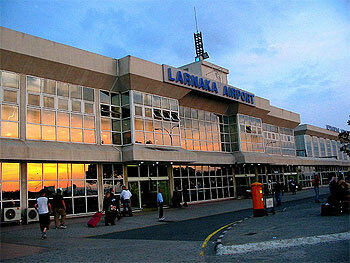 Larnaca airport is the gateway to the east of Cyprus, and the wonderful beaches of Larnaca Bay. Hire a rental car at Larnaca airport, and within minutes you can be driving along the coast beside the sparkling Mediterranean Sea, heading for your Cyprus hotel or apartment holiday. Larnaca airport car hire is also cheap compared to Larnaca airport transfers. It's tempting just to lie back in the sun on Larnaca's golden beaches, or enjoy the thrilling water sports on offer, but with a Larnaca car rental, there's so much more you can explore! Just a few minutes drive from Larnaca, and you'll be driving through vivid red fields packed with potatoes, a world away from the bustling hotel-lined coastline. Not that all the beaches near Larnaca are packed; if you prefer your coastline more rugged, book your car hire in Larnaca itself, and drive out for the day to the rugged coastline around Cape Kiti. Or explore the peaceful surroundings of the Stavrovouni Monastery, perched high in the Troodos Mountains with fabulous views down to Larnaca and the sea. Larnaca car rental is easy; We will deliver a comfortable, air-conditioned car to your hotel or apartment in Larnaca, complete with child seats if you need them. Then you and the family can head out of town, for a day's adventure in the Cyprus countryside. Why not drive to the island's capital Nicosia, the old centre of the town ringed by impressive Venetian walls. Park you Larnaca rental car and wander on foot through this ancient city, currently undergoing a massive UN sponsored restoration programme on both sides of the Green Line border. Just a short drive south of Larnaca is the Salt Lake, fringed by waving palm tree. On the shore, shimmering in the sunshine, are the domes and minarets of the Hala Sultan Tekke, a fascinating mosque which looks like it's just been lifted from a scene in Aladdin! So, collect your hire car in Larnaca or hire a car at Larnaca airport, and see the real eastern side of Cyprus on your holiday.